Are rights being lost in the war on terrorism? The Bush administration is facing strong criticism from civil liberties advocates on both the left and the right for its legal tactics in the war on terrorism. Critics charge the administration with infringing on constitutional rights by holding two U.S. citizens as “enemy combatants” without access to lawyers. Hundreds of foreigners captured in Afghanistan are also being held at Guantánamo Naval Base for trial before military tribunals. Some members of Congress are rethinking provisions of the USA Patriot Act, the sweeping law passed after the 9/11 attacks that expanded the government's search-and-surveillance powers in terrorism cases. 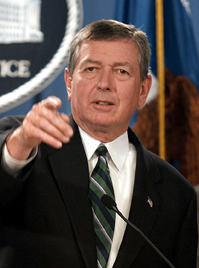 Attorney General John Ashcroft is vigorously defending the law as an essential counterterrorism tool. So far, courts have generally upheld the administration's actions, but several legal challenges are pending.